It’s easy for children — particularly Squirrel personality types — to get thrown off their game when they’re in a new situation. For kids, “new” might mean an airplane ride to Grandma’s or something as simple as using the restroom at the mall. Squirrels are particularly prone to distraction and ditching routines, so remind your child that you will continue to play the games you’ve been playing at home even when you’re out and about. Your little Squirrel loves new situations, so adapting the games will continue to keep her interested. And when you get back home, you can talk about all the bathrooms you’ve seen and compare them to your home potty. Here are some tips for when you’re on the go. Prepare your Squirrel ahead of time. “I wonder how long it will take us to play the Potty Game at Grandma’s (the restaurant, the shopping mall, etc.)? Do you think it will take more time or less? Why? Hmm. What do you think we could do when we get there to go super fast?” When you arrive at a new destination, find the nearest potty, or count the number of potties to keep your Squirrel interested. So when it’s time to go, your little learner will be confident knowing the location of the nearest loo. Be sure to pack your homemade Potty Book in your diaper bag. You can read the book together when trying out all the new potties on your journey. Give your child the option to wear Pull-Ups®, even if he’s been regularly wearing underpants. It simply helps decrease the travel stress for everyone. 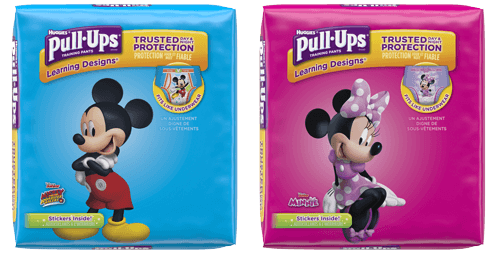 Using Pull-Ups now and again while on a long trip won’t throw off your long-term potty training plan. Stick to it as much as is reasonable, knowing there might be setbacks when your family is off the usual routine. A child who is sometimes in undies but who will be going on a long trip might do best if Pull-Ups are used because “things are going to be so different today and sometimes we won’t be able to play our potty game if the pilot says we must stay in our seats. So it’s OK to use your Pull-Ups today.” But a child who regularly wears undies might feel quite insulted at having to wear Pull-Ups again, and instead, parents should bring one along and have it handy “just in case” for use during the trip. Regardless of your child’s choice — undies or Pull-Ups — keep playing your potty games and using the Time to Potty app. You may need to let your child know when it may take longer than usual to find a potty, so don’t let him feel discouraged. Here are some helpful scripts for taking the show on the road. “How do you think we go potty in the airplane/train/bus? When we use the Time to Potty app, do you think it will take longer or shorter to find a potty? Why? This should be fun, let’s find out!"